Red wine and scallops? Heresy! This one deserves a try, because A) it’s so damn simple; and B) because at the beach house it’s all I had on hand. What surprised me was just how quick and simple it was to make. Confession: we didn’t really make risotto–that’s way too fussy for beach cooking–rather in this case it was brown rice cooked a bit too long, then steeped off the stove for a while until it got mushy and gluey. But the pan sauce loosened it up a bit. At home I’d make a real Parmesan risotto with some shredded zucchini and fresh tomatoes (https://jeffskitchen.net/2012/08/06/zucchini-parmesan-risotto/). But the scallops are fresh and local here in Chincoteague, and the dish was perfect. 1. Rinse well and pat dry the scallops–make sure they’re VERY DRY. Season with salt, pepper, and a very light dusting of Old Bay seasoning. 2. Heat the pan over medium-high heat, then add half the olive oil and count to ten. Gently place half the scallops in the pan and sear three minutes without moving them; flip and sear the other side for two additional minutes. Remove to a plate and keep them in a warm oven. Repeat with the remaining olive oil and scallops. 3. Turn the heat under the pan down to medium and add the wine and vinegar, stirring constantly to deglaze the pan. Make sure to scrape up all the brown bits in the pan into the liquid–that’s where the magic happens. Reduce the pan sauce by half. 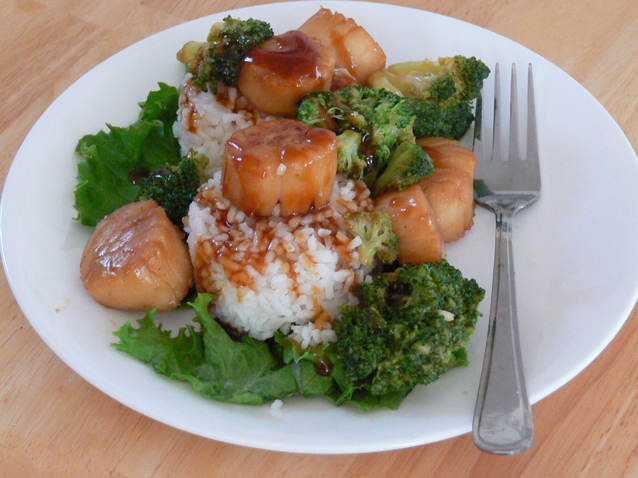 Serve the scallops over the rice or risotto and drizzle with the pan sauce. Garnish with chopped chives.